Karen Berardi, from the OP Career Tracks Team will discuss the salary ranges, labor market, cost of living and Career Tracks Program structure. 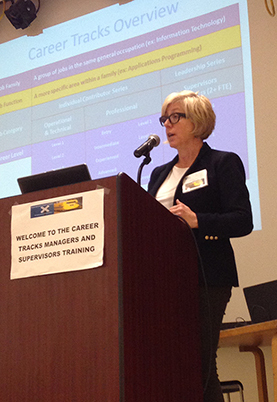 We would like to extend an invitation to participate in upcoming in-person trainings or webinars for those who were unable to attend the November 7 Career Tracks round 2 training conducted by Karen Berardi, Career Tracks consultant at University of California, Office of the President. Career Tracks is a program that seeks to align non-represented jobs to their respective labor market equivalent in order to create salary ranges that represent the labor market at each UC location. This is not a program that affects job duties or function, working ("business card") title, or current base pay. Karen Berardi will discuss the salary ranges, labor market, cost of living, and structure associated with the Career Tracks program. We believe this information is important to employees who wish to develop a deeper understanding of the Career Tracks initiative. Time: Session 1: 2–3 p.m.
Time: Session 1: 10:30–11:30 a.m.